Mexico City, Mexico, March 13, 2014 --(PR.com)-- English will maintain and enhance its supremacy in the international business arena. In its quest to teach the English language globally, One’s Word proudly launches its online English school in Latin America. One’s Word, an English language training company, has recently announced the launch of its online English school in Latin America in March 2014. The online school will provide 100 free trial lessons to interested students on a first-come-first-serve basis. With the English language increasing its supremacy in international trade and communication, it is now a basic skill required by the entire global workforce. This can be held true for Latin American countries as well, that are striving to move ahead in global business, using English as the language of reference and commerce. One’s Word hosts online English language training courses over Skype for audiences in many different parts of the word. The company is now moving into Latin America due to the sheer number of people struggling to improve their English language skills in order to avail employment opportunities within Latin America as well as in the developed world, including North America and Europe. 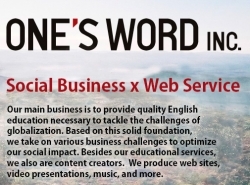 Starting its operations in Latin America from March, 2014, One’s Word will conduct online sessions through Skype. The company will also launch a Spanish as well as Portuguese website in order to target all countries in Latin America. Click here to view the list of recent Press Releases from One's Word INC.